In the last couple of years, there has been an uprising and disruptive technology called Blockchain. Originally, the Blockchain in the form of Bitcoin was only supposed to act as a ledger recording all the cryptocurrency transactions but recently, due to the interest by governments and central banks in the technology, there is now a need to formulate a proper guidance in FinTech. With the advent of Blockchain technology and DApps (decentralized aplications) a complete transformation in finance is taking shape. This training program is designed to explore FinTech fundamentals and will nosedive into ideas, concepts, hands-on practical assessments helping FinTech startups and entrepreneurs to receive a wholesome knowledge and understanding of what FinTech and Blockchain technology can truly do. Participants will gain a thorough insight into topics like Digital Finance, Data and Security, Payments, Banking Laws, Fintech Regulation and RegTech, etc. The trainer is an industry expert with several years of blockchain projects, management, consultation and DApps depolyment. Importance of Data and Security and how it all fits in FinTech. Regulations and banking laws. How all these affects the industry. A thorough look into FinTech Regulation, RegTech and how its applied. Ways to looks into what is driving technology innovation. Amarjit Singh has under his belt more than 15-years experience in IT hardware and software. He's worked with large multinationals such as IBM and Citibank before embarking on his own startups. 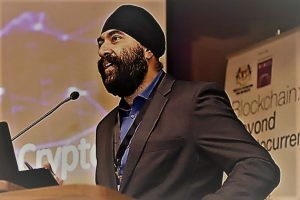 Amarjit is a Certified Microsoft Engineer (MCSE) and also one of the few Certified Bitcoin Professionals (CBP) from C4. He sits on the Board of Directors for an international organization called IDACB (International Decentralized Association of Cryptocurrency and Blockchain). He is also the founder of Crypto Knights, a crypto social community in Malaysia and Vietnam with over 1000 members. Amarjit has braced many local and international stages as a speaker. He is one of the first Malaysians to be conferred TEDx speaker in the areas of digital currencies, security, DLTs (distributed ledger technology), Blockchain, FinTech, Regtech, DApps, Big Data. In the last few years, Amarjit has been highly sought after to consult companies and FinTech with their products and how to gain funding. We are limiting the entry for this training to only 25-pax. More than half of the seats have already been taken up. If you're keen to enroll, kindly fill in the form below to reserve your spot.